Do you remember your first motorcycling experience? Of course you do. For most riders, the memory of that first trip on two wheels is as vivid as your first kiss. The simple joy of riding is what Kawasaki’s new Z125 Pro is all about. Due to hit showrooms this June with a price tag of just $2,999, Team Green’s littlest streetbike is aimed at new riders as well as anyone that just want something simple and fun. 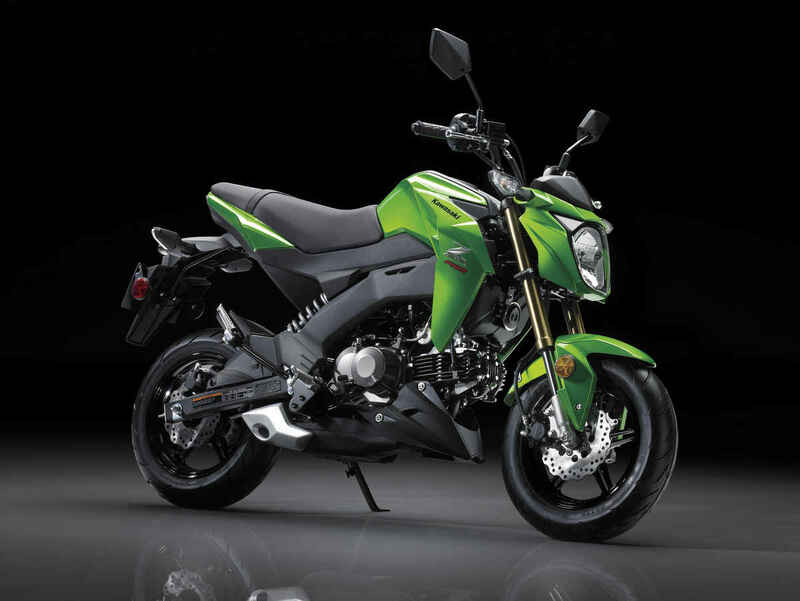 Powered by a 125cc, fuel-injected, four-speed, SOHC single, the Z125 has a welcoming 30.7-inch seat height and stated wet weight of just 225 pounds with its 2-gallon tank topped off. The bike rolls on 12-inch split-spoke wheels that sport solid petal rotors, each of which is squeezed by what looks to be a single-piston caliper. Don’t expect massive braking force from those pinchers, but then again, you probably won’t need it on a bike that’s likely to have a top speed of just 55 mph or so. That’s an inverted fork up front (albeit mighty spindly), and the offset shock is prominently displayed on the Z’s right flank. Everything hangs from a steel-backbone frame, which appears to be clad in plastic panels intended to give the chassis a twin-spar appearance. Passenger pegs mean you can pick up chicks (or do stand-up wheelies), and the pointy chin spoiler and under-engine exhaust give the bike a properly sporty look. If at this point you’re thinking that the Z125’s shape looks familiar, you’re right. The little Kawasaki rolls onto a small-bike scene dominated by Honda’s $3,199 Grom, which arrived in the US in 2014. Riders of all ages have had Grom Fever (click here to see the Honda Grom review) ever since, and Kawasaki is surely hoping to cash in on some of the mania. What sort of things do we expect owners to do with their Z125s? Commute to school and work, sure. But if the Grom is any indication, the Z125 will likely be a popular choice for mini racing (click here to watch Grom Racing), and surely somebody will try to replicate Gromkhana (watch the original here) on green bikes. Maybe it’ll be us?